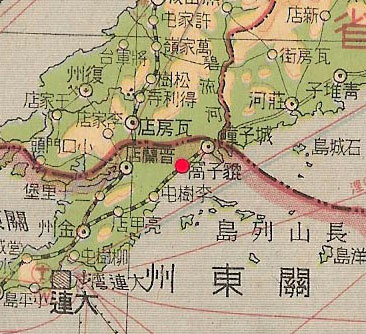 The Kwantung Leased Territory was never a part of Manchukuo but many of the cancels reflect events in Manchukuo and its association with Japan. My research shows about a 100 cancels connected to the Kwantung Leased Territory. This is not a complete list, as I find more examples I will add them. Use the "Monitor this page" box in the menu if you would like to know when more are added. 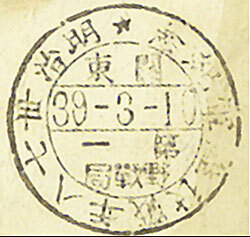 These cancels were issued in the Kwantung Leased Territory and are all dated by using Japanese era dates. It should also be noted the some place names read from left to right instead of the usual, right to left. This example was issued in 關東Kwantung. No specific PO shown. 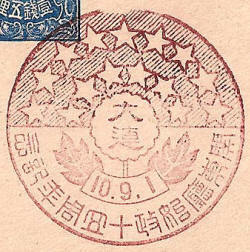 This is the first commemorative cancellation issued in Kwantung. This is an Army Day Commemorative. Known colour - black Issued 27th May 1906. This is an Navy Day Commemorative. 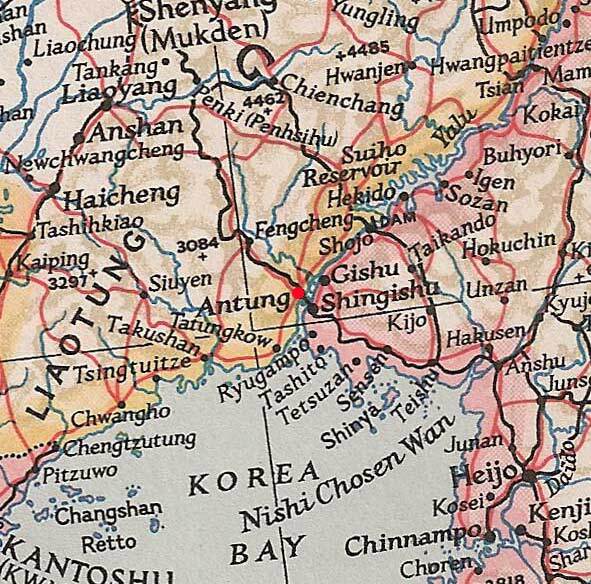 Antung is the neighboring county to Kwantung and the border was disputed at this time. 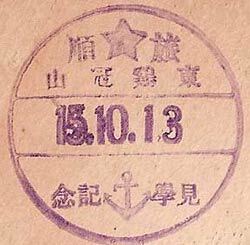 This example was issued in 安東 Antung in the SMRZ. (Also issued in Dairen and Lushun). 表忠塔竣工式記念 Dedication of war memorial. 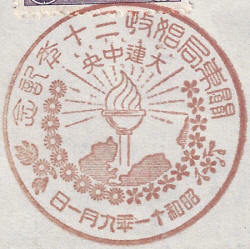 This cancel commemorates the completion of the monument to the loyal dead. This stands on Paiyushan in Lushun. Issued 1st to 31st July 1919. 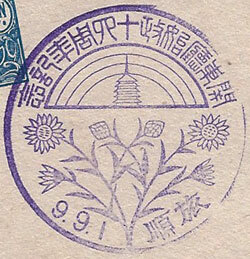 和平記念 Peace Commemoration (after WW1). 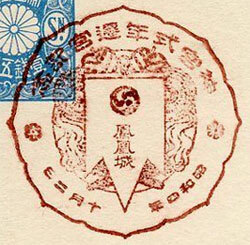 This cancel was available from 15 Post Offices in Kwantung and 58 other Post Offices in China. 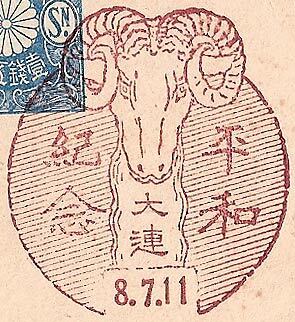 The rams head signifies the year of the sheep in the East Asian Zodiac. 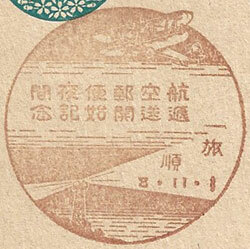 關東廳始政十四周年記念 Commemorate Fourteenth Anniversary of the Kwantung Prefectural Office. Size 39mm dia. Known colours - violet. 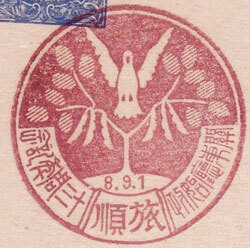 Issued 1st to 3rd November 1920. 明治神宮鎮座記念 Commemorating the dedication of the Meiji shrine. 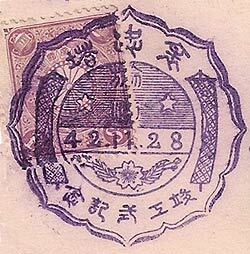 Issued 20th to 23rd April 1921. 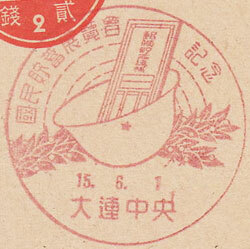 通信事業創始五十年記念 Commemorating the 50th Anniversary of the Postal Service. 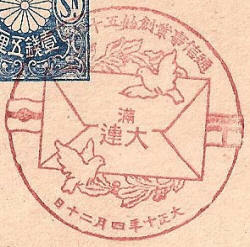 The design features an envelope flanked by the national and postal flags with two doves. 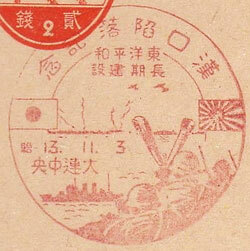 Japan also issued 4 stamps and 2 postcards to commemorate this event. Size 42mm dia. Known colours - red Issued 3rd - 4th September 1921. 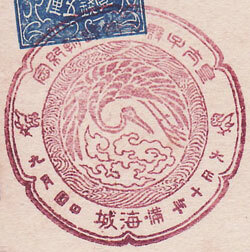 This example was issued in 海城 Haicheng, SMRZ Manchuria. (also noted in Dairen). 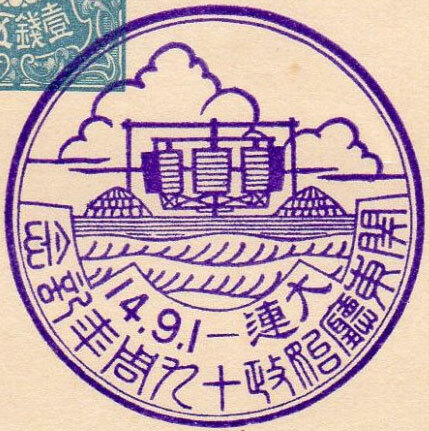 皇太子殿下御帰朝記念 Commemorating the return of Crown Prince Hirohito from his visit to Korea. 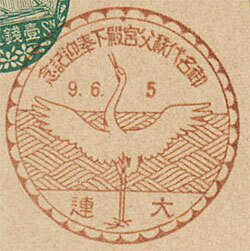 The design features the Imperial Crane with Auspicious Clouds. Known colours - blue Issued 9th August to 18th September 1925. 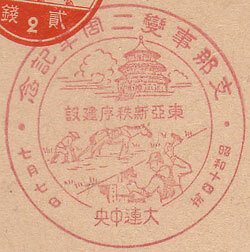 Issued to promote the Dairen Industrial Fair. Size 37mm dia. Known colours - violet. The design features modern buildings and machines probably aimed at illustrating progress. The inscription celebrates 19 years of colonial rule. This cancel was used on 20th and 26th September, 6th and 23rd October and 2nd, 6th and 11th November 1926. These were probably flight days. 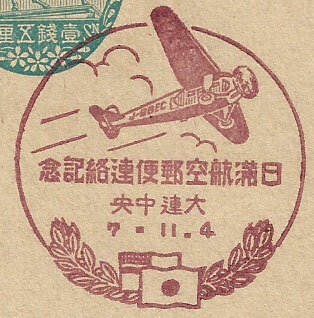 大連京城大阪間第一回飛行郵便記念 First Airmail Flight between Dalian, Seoul and Osaka. A light aircraft with a laurel wreath. 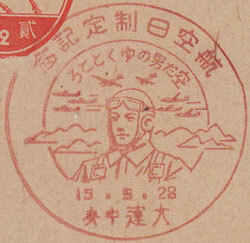 The characters read "Commemorating the airmail service between Dairen, Keijō (Seoul, Korea), and Osaka (Japan). Issued 24th to 27th September 1926. This example was issued in 旅順 Lushun (Port Arthur) P.O. Design features - The Chinese symbol for long life complete with lucky bats and an auspicious cloud. The characters read "20th anniversary of the Kanto Cho (Kwantung Office) Commemorative" a set of official postcards was also issued and these can be seen here. Size 38mm dia. 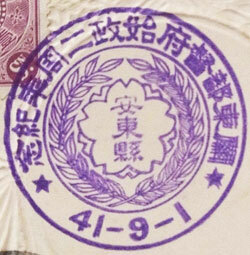 Known colours - violet Issued 13th October 1926. This may be a cancel issued by the Military as it is of very basic design. It commemorates an inspection, I assume of the army and navy in the area. 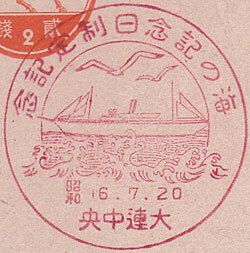 Issued 20th to 23rd June 1927. To celebrate the 50th of the Japanese accession to the UPU. 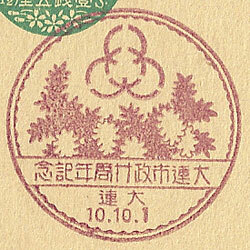 A set of four special stamps were issued in Japan in relation to this. Size 35mm dia. Known colours - Red. Issued 22nd to 24th September 1928. To celebrate the Athletics Meet in Commemoration of the Enthronement. Size 35mm dia. Known colours - Purple. 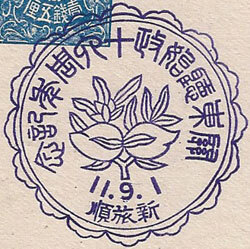 Issued 10th to 14th November 1928. To celebrate the Coronation of Emperor Showa. The design shows a giant ceremonial drum dadaiko and a golden kite. 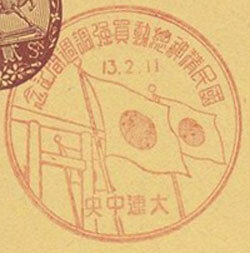 Japan issued a set of 4 stamps and two commemorative postcards in honour of this event. Size 37mm dia. Known colours - red. 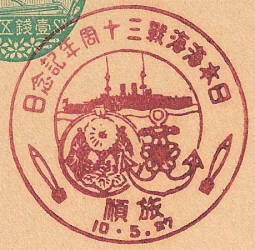 Issued 1st to 6th April 1929. 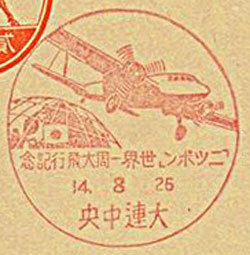 To celebrate the start of the airmail service from Japan to Dairen - China's first international airmail service. Size 35mm dia. Known colours - red. 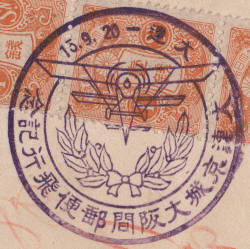 Issued 2nd to 5th October 1929. 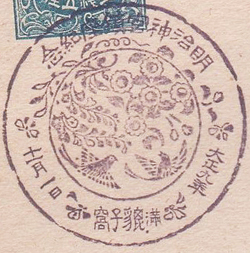 This example was issued in 鳳凰城 Feng-huang-ch’eng in the SMRZ, Manchuria, also issued in Dairen. Size 35mm dia. Known colours - red. Issued 1st to 7th July 1930. To celebrate a Communications Exhibition. The building is Dairen's main Telephone Exchange and Telegraph Office. The aerial on the roof probably means that the radio station also had offices there. Size 35mm dia. Known colours - red/brown. Issued 1st to 4th October 1930. 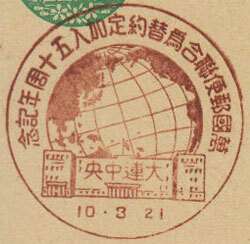 This cancel commemorates the 1930 census. The census was carried out every five years. A full census in years ending "0" and a simplified census years ending with a "5". Size 35mm dia. Known colours - red. 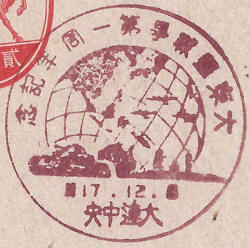 Issued 1st to 3d November 1930. 10th Anniversary of the Dedication of Meiji Shrine in Tokyo. 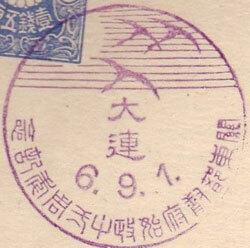 This cancel was available from 15 Post Offices in Kwantung and 66 other Post Offices in China. Japan issued a set of 2 commemorative stamps in conjunction with this event. Size 37mm dia. Known colours - red. Issued 18th to 19th September 1932. 満洲事変一周年記念 reads Commemorating the First Anniversary of the Manchurian Incident. The design features a map with Mukden in the centre with a soldier, stalks of kaolin, a barbed wire entanglement and a bird in flight. This cancel has a changeable day date which can read 18th (above) or 19th. Issued 3rd to 5th November 1932. 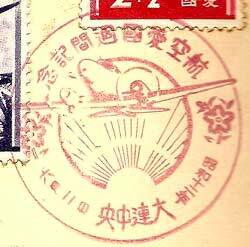 The Manchukuo air mail service began operation on 3rd November 1932 with airmail delivered by the Manchukuo Air Transport Company. 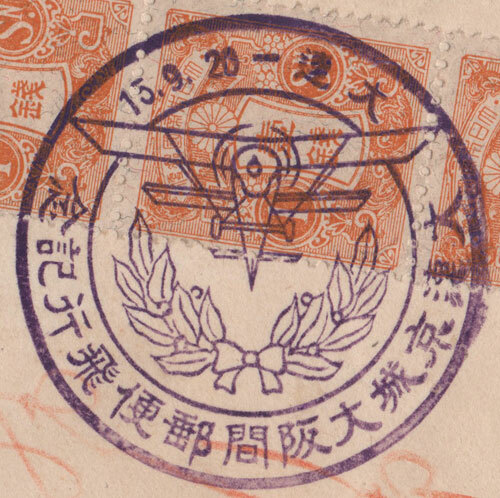 An airmail system already existed between Japan and Manchuria operated by the Japanese, this recognises the start of the Manchurian operation of the service. 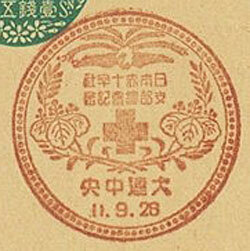 This cancel was widely available in Japan, the KLT and mail SMRZ post offices in Manchukuo. 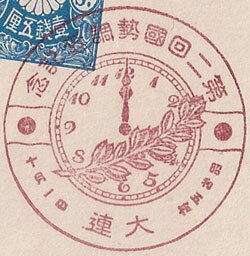 This cancel has a changeable date, the right hand Chinese day date figure can read 3,4 (above) or 5. Size 37mm dia (excluding wing). Known colours - red only. Issued 23rd July to 31st August 1933. 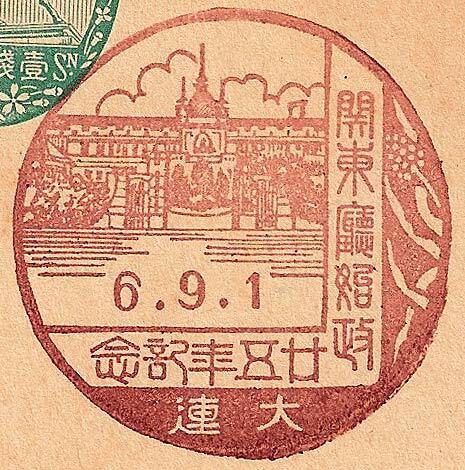 満州大博覧曾記念 Manchuria Exposition Commemoration. The fair site was held on reclaimed land at the foot of Mt. Baiyun, Dairen. Many special cancel postcards, in colour and black and white, were issued to promote this event. Size 42mm dia. 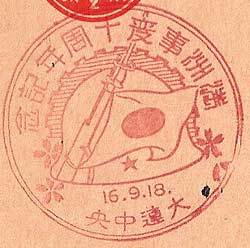 Known colours - red Issued 15th September 1933 (Japanese year date) not listed by Zirkle - SMRZ Post Offices only. The characters read 満洲国承認一周年記念Commemorating the 1st Anniversary of (Japan's) Recognition of the State of Manchukuo. 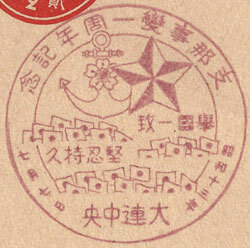 The design features the flags of Manchukuo over a map of the new state. 航空郵便夜間逓送開始記念 reads Start of Night Airmail Services Commemoration. The cancel shows a bi-plane flying above a lighthouse at night. The date is changeable and can read 1st to 3rd. 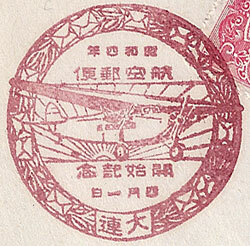 In China Stamp Radar shows this cancel for Dairen, Lushun (Port Arthur), Antung, Mukden and finally Hsinking, an indication of the route flown. 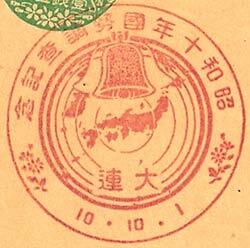 In Japan the cancel ran from 1st to 6th and covered various stops between Tokyo and Fukuoka. 皇太子殿下御誕生奉祝記念 reads Commemorating Celebrating the birth of the Crown Prince. 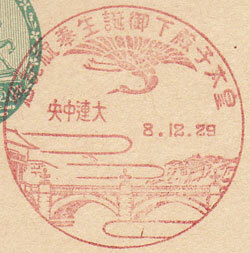 The cancel shows an Imperial Phoenix above a bridge. The date is changeable and can read 29th to 31st. This is the birth of Akihito the present Emperor of Japan (Tennō ). He was born on 23rd December 1933, son of Hirohito (Shōwa). Issued 18th to 19th September 1933. (Japanese year date 8) not listed by Zirkle - SMRZ Post Offices only. 満洲事変二周年記念 reads Commemorating the Second Anniversary of the Manchurian Incident. 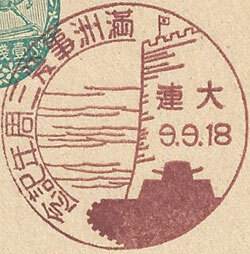 The design features Japanese soldiers attacking Mukden. The shape of this cancel is unusual being in the shape of a shield with castellated edging. Size 40mm x 40.5mm. Known colours - orange red Issued 1st to 3rd March 1934. 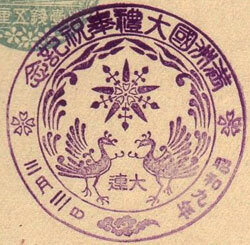 Design features; the emblem of Manchukuo and two phoenix. The characters read 满洲國大礼奉祝纪念 Manchurian Solemn Ceremony Offering Respect Commemorative, the date represents the second anniversary of the founding of Manchukuo. 禦名代秩父宮殿下奉迎記念 reads Welcome the Imperial Representative, Prince Chichibu. This commemorates a visit by Prince Chichibu, younger brother of the Emperor Showa as the Imperial Envoy to Hsinking. 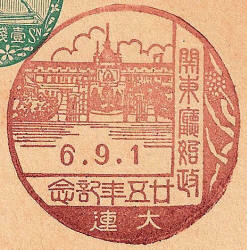 The visit took place during June 1934. On 6th June he visited the the Emperor Kang-te to congratulate him on his enthronement and present him with the Japanese Grand Cordon of the Chrysanthemum (Japans highest honour) and the Order of the Precious Crown to his Empress Wanrong. Size 36mm dia. Known colours - red Issued 19th to 21st June 1934. This example was issued in 大連 Dairen. 関東州防空演習記念 Kwantung area air defence exercise. Issued 18th to 19th September 1934. 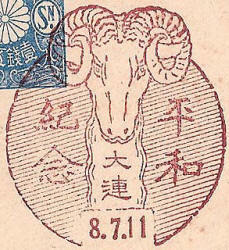 (Japanese year date 9) not listed by Zirkle - KLT and SMRZ Post Offices only. 満洲事変三周年記念 reads Commemorating the Third Anniversary of the Manchurian (Mukden) Incident. Size 35mm dia. Known colours - red Issued 21st to 24th March 1935. This example was issued in 大連 Dairen. 萬國郵便聯合為替約定加入五十週年紀念 reads 50th Anniv. of Acceding to the Exchange Agreement of the Universal Postal Union. 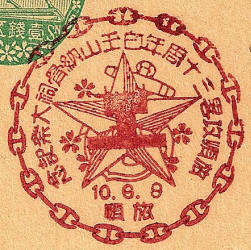 Issued in honour of the Universal Postal Union's 50th Anniversary of Japan signing up to the exchange of International Money Orders. 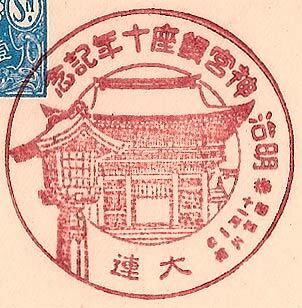 The building is listed in The Large Commemorative Datestamps of Japan 1902 -1944 by Charles A. L. Swenson as being the Savings Bureau Building. The date is changeable and can read 21st (above), 22nd, 23rd or 24th. 满洲国皇帝陛下訪紀念 reads Commemorating the Manchukuo Imperial Visit. 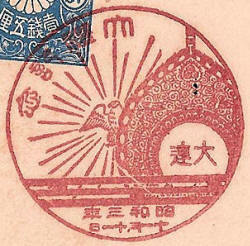 Issued in recognition of the Emperor Kangteh's first visit to Japan. The inscription is the same as Zirkle 12 above. The design features a wreath of rice and corn with Orchids and Chrysanthemum. Size 35mm dia. Known colours - red Issued 27th May 1935. 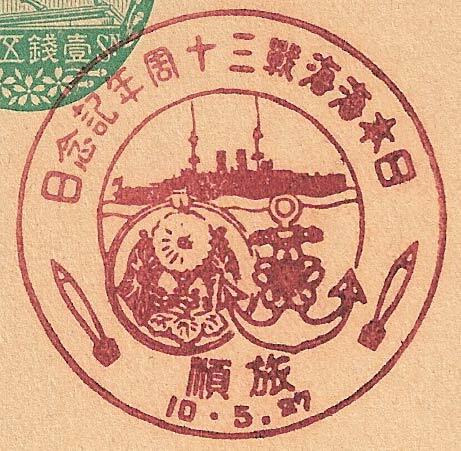 Design features; a battleship and naval emblems flanked by two torpedoes. The characters read 日本海海戰三十周年記念 Commemorating the 30th Anniversary of the Battle of the Japan Sea. The design features; The Army Star and Naval Anchor. The characters read 30th anniversary of Ryojun Baiyushan ceremony of depositing the ashes of the dead. Ryojun (The Japanese name for Port Arthur). 大連市政卄周年記念 Commemorating the 20th anniversary of Dairen Municipal Government. 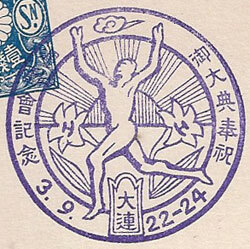 The emblem is the city emblem of Dairen. 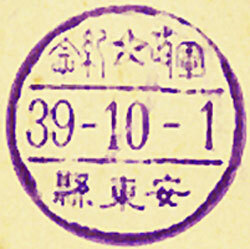 This example was issued in 大連中央 Dairen Central P.O. 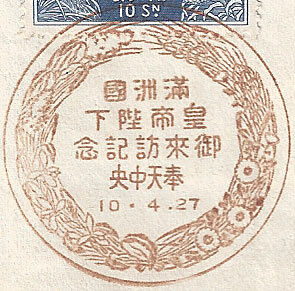 日満 郵便條約締結記念 reads Commemorating the Conclusion of the Japan-Manchukuo Postal Treaty. 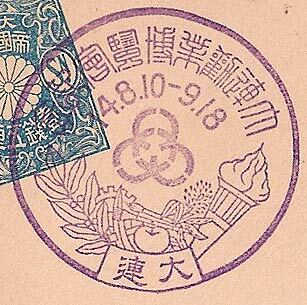 The central image is of a letter framed by the national flowers of Japan and Manchukuo. 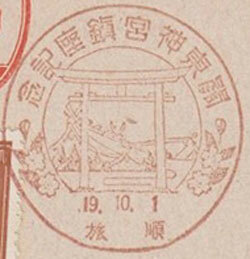 Issued 1st to 4th March 1936 (Japanese year date) not listed by Zirkle - SMRZ Post Offices only. 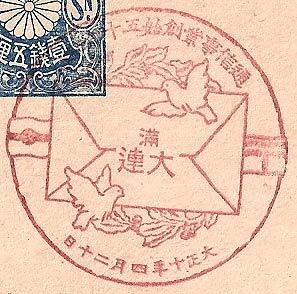 日本カナダ間郵便為替新約定實施記念 (Ji in “jisshi” is now written 実; the old form is 實) translated "The implementation of the new postal money order agreement between Japan and Canada". I doubt there was much rejoicing in Manchukuo as a result of this. Available in China only from Dairen Central PO, Mukden Central PO, Hsinking Central PO and Yingkow. Size 35mm dia. Known colours - red. Issued 1st September 1936. 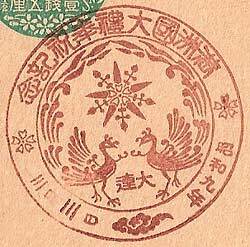 (Japanese year date 9) not listed by Zirkle - SMRZ Post Offices only. 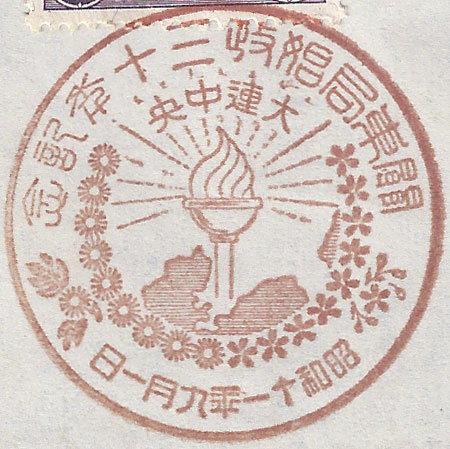 The design features the emblem of a torch placed over the Kwantung peninsular. 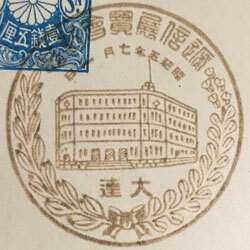 関東廳始政三十年記念 30th Anniversary of Kanto Chō (Government Office). 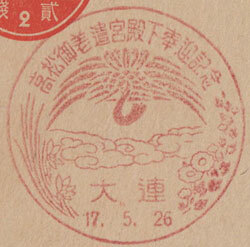 The design features 3 auspicious clouds surrounding a Japanese emblem. The designer seems to have taken this literally as the image is of two branches meeting in the middle. 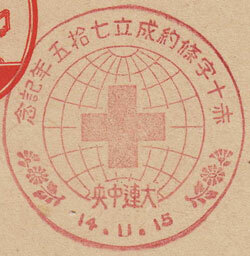 Clearly branches of the Red Cross. 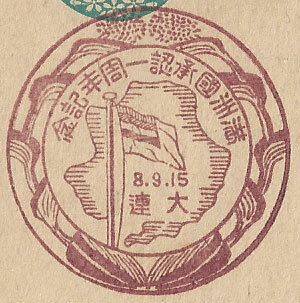 Issued 18th to 19th September 1936. 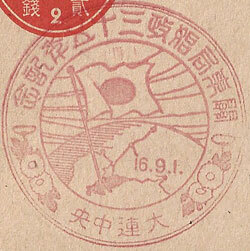 (Japanese year date 9) not listed by Zirkle - SMRZ Post Offices only. This example was issued by Dairen P.O. 満洲事変五周年記念 reads Commemorating the Fifth Anniversary of the Manchurian Incident. 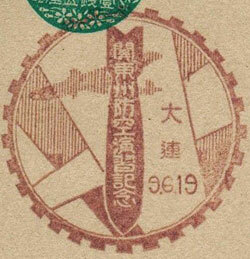 The design features a artillery shells and kaolin stalks either side of an image of the Mukden Incident Medal. 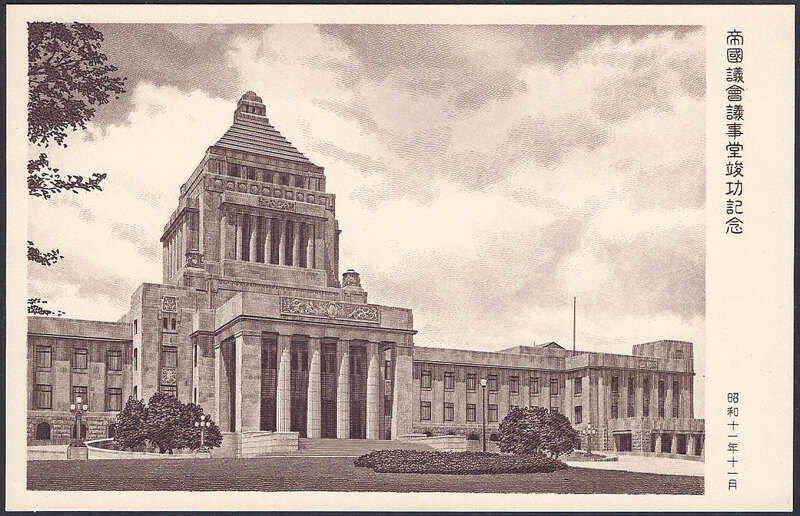 the completion of the diet building (the Japanese Parliament building) in Tokyo. This cancel is on a Postcard showing the new building which can be seen here. 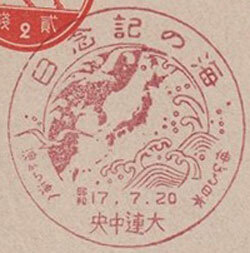 Japan issued a set of four stamps to commemorate this event. 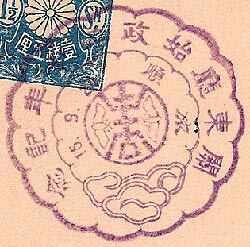 According to the Encyclopedia Japanese Philately this cancel was available at all 1st and 2nd class and designated 3rd class PO's. In China this was limited to Dairen Central PO, Lushun Central PO, Mukden Central PO and Hsinking Central PO. Issued 1st to 7th June 1937. This is a Patriotic Aviation Week Commemorative cancel. Click here to see it on an official postcard promoting the event. 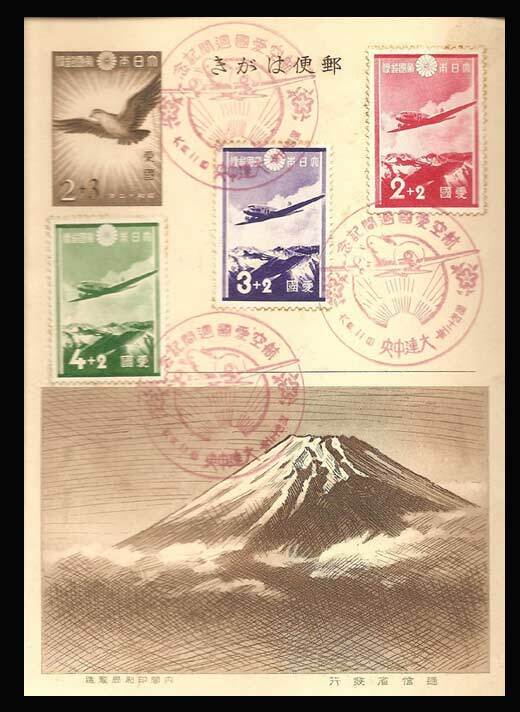 Japan also issued a set of 4 stamps. 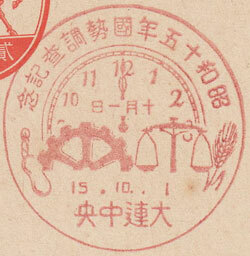 This cancel has a changeable date, the Chinese day date figure can read 1, 2 (above), 3, 4, 5, 6, or 7. 國民精神總動員強調週間記念 National spiritual mobilization week. The design is three Japanese flags and the gate to a shrine. 支部 事變一周年記念 Marco Polo Bridge Incident First Anniversary. The cancel features Japanese flags with the Army and Navy emblems. 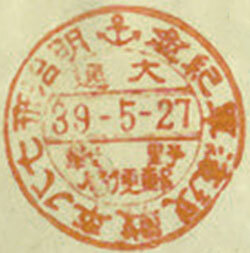 This cancel commemorates a National Defence Exhibition. 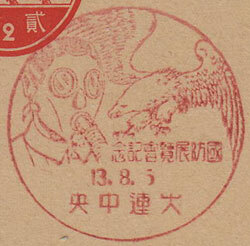 The design features a gas mask and (probably) an image representing the eagle that flew to the defence of the first Japanese emperor; Jimmu. 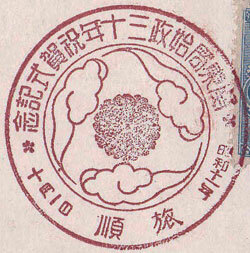 This cancel commemorates the Fall of Hankow. Hankow was where the Chinese Government had its military headquarters. Commemorating the 2nd Anniversary of the China Incident. 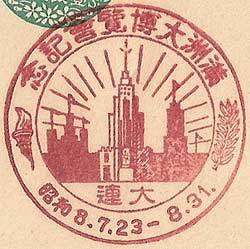 The slogan in the centre reads 東亞新秩序建設 Building a New Order in East Asia. The images of China including the Temple of Heaven, a Chinese farm worker and a Japanese factory worker. ニツポン世界一周大飛行記念 Commemorating the around the world flight of the [Nippon]. The aircraft used was a modified Mitsubishi G3M2 “Nell” bomber. The flight had to be diverted because Germany invaded Poland and was completed later in September. More information here. The P.O. is not specified. 紀元二千六百年記念 2600 Anniversary of the founding of Japan. 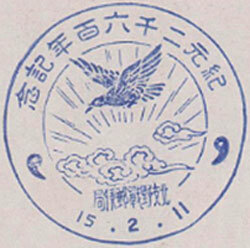 The image is of the eagle that came to the rescue of the first Emperor Jimmu flying above auspicious clouds. Commemorating the Designation of Aviation Day, this cancel features an airman with aircraft. 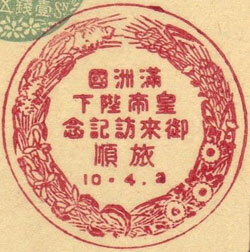 This cancel commemorates a National savings exhibition. The image shows a savings book in an army helmet. 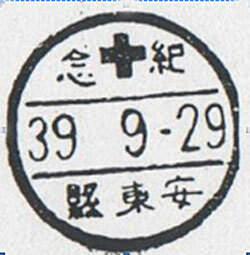 This cancel was issued to mark the 1940 National Census. The design features a clock, a cog wheel, a balance and crops. Design features - An image of the two masted topsail schooner Meiji Maru. This ship was used to give the Meiji Emperor a tour of northeast Japan in 1876 and named in his honour. Size 35mm dia. Known colours - red Issued 18th September 1941. 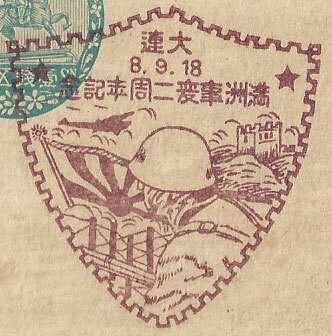 Design features - A Japanese flag and a soldiers helmet. 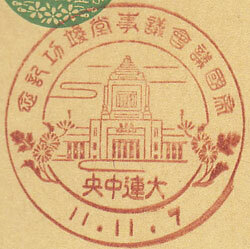 The characters read "Manchurian Incident 10th year Commemorative"
関東廳始政三十五年記念 30th Anniversary of Kanto Chō (Government Office). 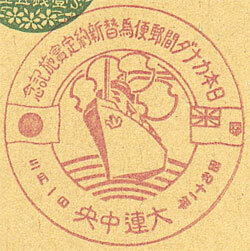 The design features the Japanese flag planted on the Laiodong peninsula. 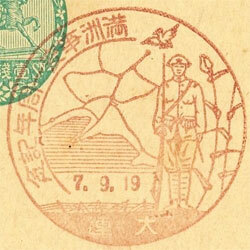 The cancels commemorates the fall of Singapore. 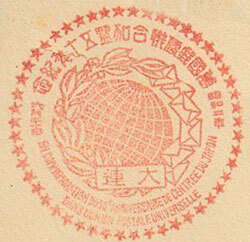 Note that although Dairen is on mainland China the text is now Japanese. This example was issued in 大連 Dairen P.O. 高松御差遣宮殿下奉迎記念 reads Welcome his Highness Prince Takamatsu. Design features - The Imperial Phoenix with auspicious clouds. Prince Takamatsu (1905 to 1987) was the third son of Emperor Taishō (Yoshihito). 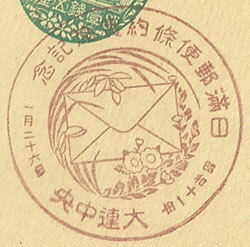 This cancel is very unusual because the text reads left to right, both the inscription and the Post Office name. I can find no explanation as to why they did this and as far as I know this is unique. Size 35mm dia. Known colours - red Issued 20th July 1942. Design features - a raging sea with seagulls. 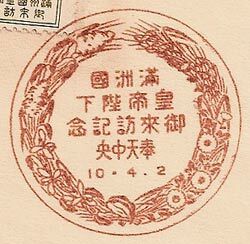 Available 1st to 4th March and 15th to 18th September 1942 these dates coincided with the issue in Japan of two sets (each of 2 stamps) used to mark the event. This example was issued in 甘井子 Dairen Ganjingzi P.O. 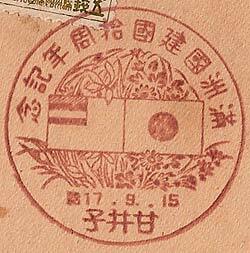 Design features - Flags on Japan and Manchukuo surrounded by flowers. The inscription reads 满洲建國十年纪念 Manchuria Founding 10 year Commemorative. Size 35mm dia. Known colours - red Issued 8th - 14th December 1942. Design features - A globe turned towards Asia showing tanks and war planes.. 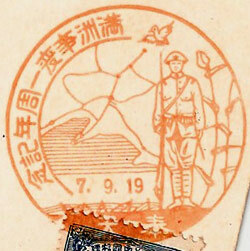 The inscription reads 大東亞戰爭 一周年纪念 First Anniversary of the Greater East Asia War Commemorative. 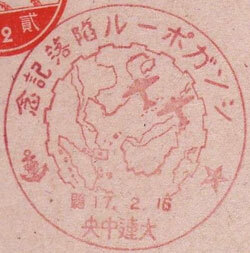 The Japanese issued two stamps featuring the attack on Pearl Harbour. Issued 8th to 14th December 1943. 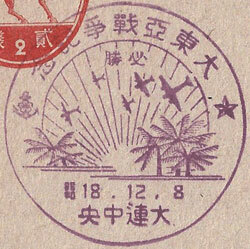 The design features bombers flying over a Pacific atoll with the symbols of the army and navy below the inscription which reads 大東亜戦争纪念 Commemorate the Greater East Asia War. Size 35mm dia. Known colours - red Issued 1st October 1944. The design features a Shinto Shrine at Lushun (Port Arthur). 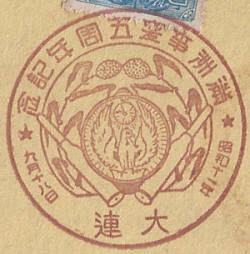 記念関東神宮魯迅 reads Commemorate the Kanto Jingu Lushun. 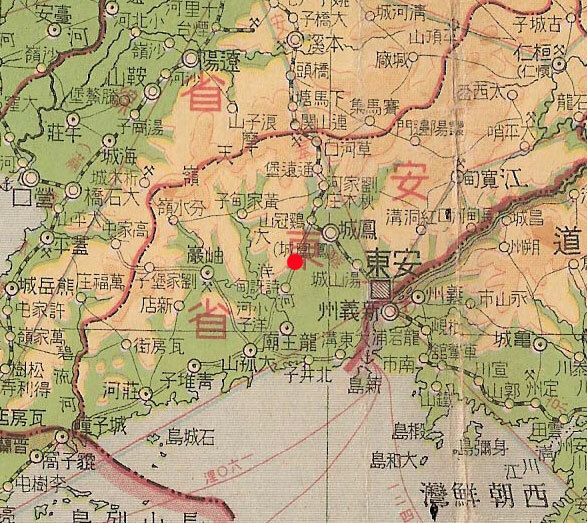 I have found the "Philatelic Gazetteer of Manchoukuo and Kwantung Leased Territory, South Manchurian Railway Zone" by George A Fisher very useful in researching the place names shown in this section. For cancels only available from Japanese PO's see The Large Commemorative Datestamps of Japan 1902 -1944 by Charles A. L. Swenson. Both booklets are available from the International Society for Japanese Philately Inc.